It was a rough day, and I didn’t know why it was rough. It is just it is. Just my mood swings as usual, I guess. So I was thinking to stop by at st. Joseph church at bukit timah after work, do a quick prayer at the 14 ways of the cross on the way home. That was my first intention. 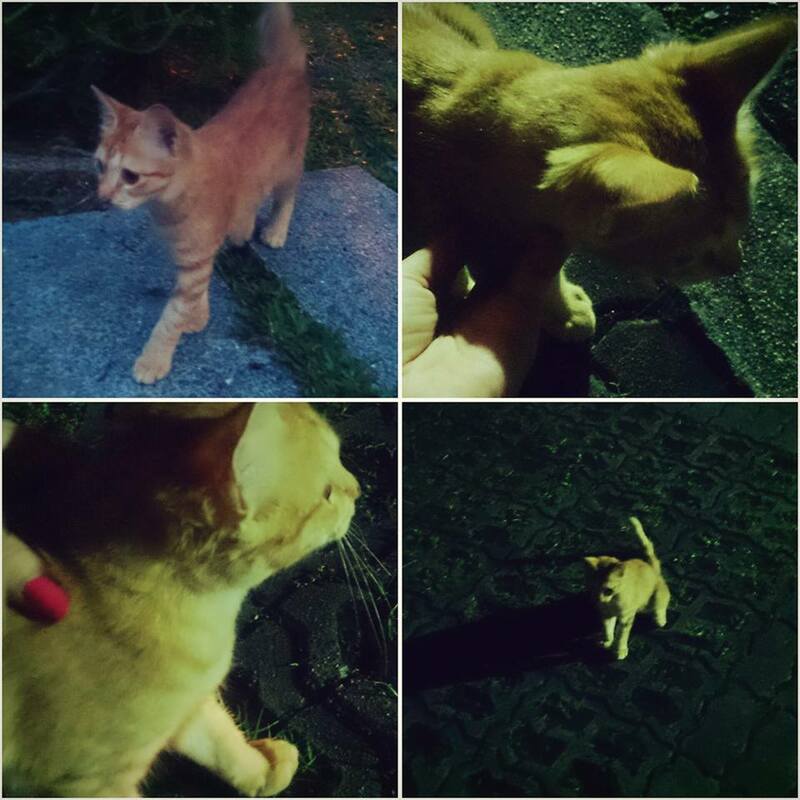 But when I alighted at the bus stop across the church, I saw this sweet girl wandering around the bus stop, meowing at nothing. Seemed like she was lost, scared by many cars passing by and loud noises from the traffic. So I decided to pick her up and bring her with me to the church. I immediately felt so relate to this sweet girl. I named her noni-chan. ‘Noni’, as that is how my mom used to call me at home. And this beautiful kitten, so young, so alone, so scared, so lost, yet so brave. She reminds me of myself. I’m a young lady too, so alone in this strange country, felt so scared if I would survive here, and so lost as it very difficult for me to find a place to fit in. But maybe I am brave too. But that is not because I am such a superwoman who can conquer the world by myself, but mostly because I have no choice but to be brave. Carrying noni in my arm crossing a very busy street to the church, reminds me how I am also scared, I don’t know why God carry me in His arm, crossing a scary places, I might be clawed too hard trying to grab Him tight and hope He didn’t drop me. But yet I can feel His gentle arm always protect me. He probably just want me to be calm and trust him, and He will bring me to a safer place. When I finally put noni in a grassy yard at the church, I could see her very happy playing around with the wild bushes. She is now away from the noisy traffic, the scary part. But here too, too dark and no one was there. Like I know how God always put me in a safer place after the scary part, but I always find myself alone. I know how even noni distracted by bugs and critters at the grass, but she didn’t want to be away from me. She followed me around. Like I followed God, even though I got distracted many times by many things, but I still hope God would never ever leave me. And when I tried to lead noni to brighter place with more lighting and away from the dark, even when noni didn’t want me to be away from her, but she was also unsure to follow me either. I always want God to be around me, but even when He lead me to a brighter place I am not sure if I should follow Him. And if I slowly hesitated to follow Him, trying hard to trust Him, was it the correct way? It was almost an hour with noni in the church’ backyard and failed calling SPCA many times. It was getting late and I needed to go back home. Finally SPCA picked up my call. But it was a bad news because SPCA couldn’t rescue her as they were already busy with more urgent cases. They suggested me to leave her in a quiet place, as noni already a grown up, she can take care of herself and there will be volunteers feeding the stray animals at night. It was a tough choice. I didn’t want to leave noni alone. I don’t want myself to be left alone! But since pets are not allowed in my condo, and my ex-colleague also couldn’t adopt her, so I had no choice but to leave her in this church. I decided to pick her up once again, whispered in her ear that she will be alright tonight, and brought her to kindergarten’s yard, with hope tomorrow there will be kids found her and bring her home. So today I have been saved by a kitten! I know I will survive tonight. And tomorrow there will be new hopes for me too. Even though I can’t see God with my eyes, but I know He always remember me. 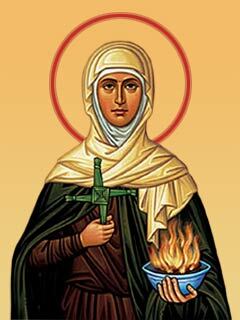 Brigid is celebrated for her generosity to the poor. In her case, most of the miracles associated with her relate to healing and household tasks usually attributed to women. When Brigit was of marital age, a man by the name of Dubthach moccu Lugair came to woo her. Since Brigid offered her virginity to God, she told the man that she cannot accept him but to go to the woods behind his house where he will find a beautiful maiden to marry. Everything that he says to the maiden’s father will be pleasing to them. The man followed her instructions and it was as she said. In one story, Brigid protected a woman from a nobleman who had entrusted a silver brooch to the woman for safekeeping but then accidentally dropped it into the sea. He charged her with stealing it, knowing that he could take her as a slave if a judge ruled in his favor. 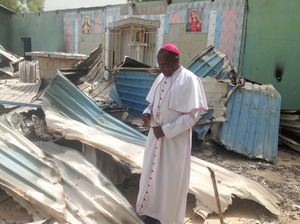 The woman fled and sought refuge with Brigid’s community. By chance, one of her fishermen hauled in a fish which, when cut open, proved to have swallowed the brooch. The nobleman freed the woman, confessed his sin, and bowed in submission to Brigid. A similar story is told of St Kentigern. On another occasion, Brigid was travelling to see a physician for her headache. She stayed at the house of a Leinster couple who had two deaf daughters. The daughters were travelling with Brigid when her horse startled, causing her to fall and graze her head on a stone. A touch of Brigid’s blood healed the deaf girls. When on the bank of the River Inny, Brigid was given a gift of apples and sweet sloes. She later entered a house where many lepers begged her for these apples, which she offered willingly. The woman who had given the gift to Brigid was angered by this, saying that she had not given the gift to the lepers. Brigid was angry at the nun for withholding from the lepers and cursed her trees so they would no longer bear fruit. Yet another woman also gave Brigid the same gift, and again Brigid gave them to begging lepers. This time the second woman asked that she and her garden be blessed. Brigid then said that a large tree in the virgin’s garden would have twofold fruit from its offshoots, and this was done. One Easter Sunday, a leper had come to Brigid to ask for a cow. She said she would rest and would help him later; however, he did not wish to wait and said he would go somewhere else for a cow. Brigid then offered to heal him, but the man stubbornly replied that his condition allowed him to get more than he would if he were healthy. After convincing the leper that this was not so, she told one of her maidens to have the man washed in a blessed mug of water. After this was done, the man was healed and vowed to serve Brigid. One of the more commonly told stories is of Brigid asking the King of Leinster for land. She told the king that the place where she stood was the perfect spot for a convent. It was beside a forest where they could collect firewood and berries. There was also a lake nearby that would provide water and the land was fertile. The king laughed at her and refused to give her any land. Brigid prayed to God and asked him to soften the king’s heart. Then she smiled at the king and said “will you give me as much land as my cloak will cover?” The king thought that she was joking and, hoping to get rid of her, he agreed. She told four of her sisters to take up the cloak, but instead of laying it flat on the turf, each sister, with face turned to a different point of the compass, began to run swiftly, the cloth growing in all directions. The cloak began to cover many acres of land. “Oh, Brigid!” said the frighted king, “what are you about?” “I am, or rather my cloak is about covering your whole province to punish you for your stinginess to the poor.” “Call your maidens back. I will give you a decent plot of ground.” The saint was persuaded, and if the king held his purse-strings tight in future, she had only to allude to her cloak to bring him to reason. Soon afterwards, the king became a Christian, began to help the poor and commissioned the building of the convent. Legend has it, the convent was known for making jam from the local blueberries which was sought for all over Ireland. There is a new tradition beginning among followers of St Brigid to eat jam on 1 February in honour of this miracle. After Brigid promised God a life of chastity, her brothers were grieved at the loss of a bride price. When she was outside carrying a load past a group of poor people, some began to laugh at her. A man named Bacene said to her, “The beautiful eye which is in your head will be betrothed to a man though you like it or not.” In response, Brigit thrust her finger in her eye and said, “Here is that beautiful eye for you. I deem it unlikely that anyone will ask you for a blind girl.” Her brothers tried to save her and wash away the blood from her wound, but there was no water to be found. Brigid said to them, “Put my staff about this sod in front of you”, and after they did, a stream came forth from the ground. Then she said to Bacene, “Soon your two eyes will burst in your head” and it happened as she said. There was an old pagan Chieftain who lay delirious on his deathbed in Kildare (some believe this was her father) and his servants summoned Brigid to his beside in the hope that the saintly woman may calm his restless spirit. Brigid is said to have sat by his bed, consoling and calming him and it is here that she picked up the rushes from the floor and began weaving them into the distinctive cross pattern. Whilst she weaved, she explained the meaning of the cross to the sick Chieftain and it is thought her calming words brought peace to his soul, and that he was so enamoured by her words that the old Chieftain requested he was baptized as a Christian just before his passing. Since that day and for the centuries that followed, it has been customary on the eve of her Feat Day (1st February) for the Irish to fashion a St Brigid Cross of straw or rushes and place it inside the house over the door. One night, Barbara asked her father, “Why isn’t my mommy like everybody else’s mommy?” As he struggled to answer his daughter’s question, Bob remembered the pain of his own childhood. A small, sickly boy, he was constantly picked on and called names. But he wanted to give his daughter hope, and show her that being different was nothing to be ashamed of. More than that, he wanted her to know that he loved her and would always take care of her. So he began to spin a tale about a reindeer with a bright red nose who found a special place on Santa’s team. Barbara loved the story so much that she made her father tell it every night before bedtime. As he did, it grew more elaborate. Because he couldn’t afford to buy his daughter a gift for Christmas, Bob decided to turn the story into a homemade picture book. In early December, Bob’s wife died. Though he was heartbroken, he kept working on the book for his daughter. A few days before Christmas, he reluctantly attended a company party at Montgomery Ward. His co-workers encouraged him to share the story he’d written. After he read it, there was a standing ovation. Everyone wanted copies of their own. Montgomery Ward bought the rights to the book from their debt-ridden employee. 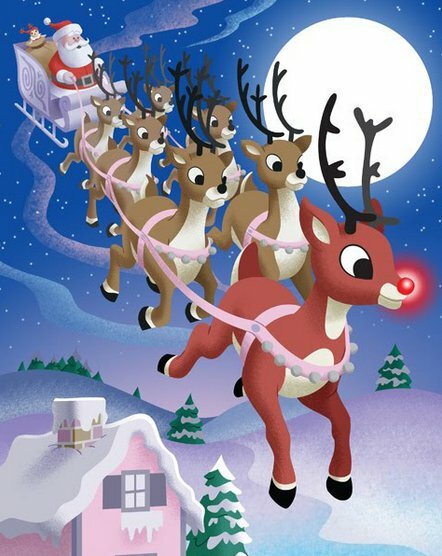 Over the next six years, at Christmas, they gave away six million copies of Rudolph the Red Nosed Reindeer to shoppers. Every major publishing house in the country was making offers to obtain the book. In an incredible display of good will, the head of the department store returned all rights to Bob May. 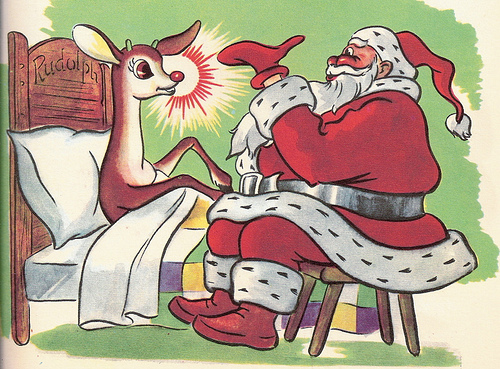 Four years later, Rudolph had made him into a millionaire. Now remarried with a growing family, May felt blessed by his good fortune. But there was more to come. His brother-in-law, a successful songwriter named Johnny Marks, set the uplifting story to music. The song was pitched to artists from Bing Crosby on down. They all passed. Finally, Marks approached Gene Autry. The cowboy star had scored a holiday hit with “Here Comes Santa Claus” a few years before. Like the others, Autry wasn’t impressed with the song about the misfit reindeer. Marks begged him to give it a second listen. Autry played it for his wife, Ina. She was so touched by the line “They wouldn’t let poor Rudolph play in any reindeer games” that she insisted her husband record the tune. “Life is a constant Advent season: we are continually waiting to become, to discover, to complete, to fulfill. 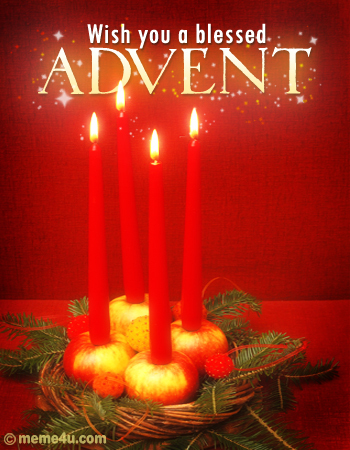 Hope, struggle, fear, expectation and fulfillment are all part of our Advent experience. “The world is not as just, not as loving, not as whole as we know it can and should be. But the coming of Christ and his presence among us—as one of us—give us reason to live in hope: that light will shatter the darkness, that we can be liberated from our fears and prejudices, that we are never alone or abandoned.